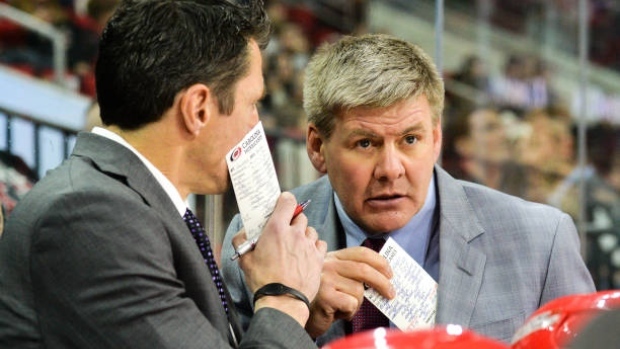 Carolina Hurricanes head coach Bill Peters has until Friday to opt out of his contract with the team, while TSN Hockey Insider Bob McKenzie reports the situation has become sort of a standoff with new Hurricanes owner Tom Dundon. Interesting game of cat and mouse going on in CAR with head coach Bill Peters and owner Tom Dundon. Peters, for now, has option to leave CAR. Sense is Peters’ strong preference is to NOT return. He is a candidate in CGY/DAL and belief is the Albertan’s preference is to go home. McKenzie reported the sense is Peters' strong preference is not to return and pursue opportunities elsewhere. He is a candidate for the openings with the Calgary Flames and Dallas Stars, per McKenzie, and the belief is Peters, an Alberta native, would like to go home. Meanwhile, the sense is Dundon also has a strong preference for Peters to NOT come back. If Peters exercises his option to leave, Dundon is off the hook for Peters’ contract and would be free to name a new head coach. Perhaps Rod Brind’Amour. McKenzie added Dundon's preference is for Peters to not return as well, but may be hoping Peters exercises his option to leave so that Dundon is not on the hook for his contract. Should Peters leave, Dundon would be free to name a new head coach, with Rod Brind'Amour brought up as a potential candidate, per McKenzie. But if Peters doesn’t use option to leave, if timing and/or prospects of CGY/DAL job don’t materialize during window, Peters may not be eager to walk away from CAR with $ (one year) still on table. May prefer to be fired, but Dundon doesn’t like firing, prefers reassigning. Adding another layer to the situation, McKenzie reported Peters' preference may be to be fired so that he doesn't leave money on the table, but Dundon's preference would be to reassign the coach rather than let him walk. Peters will make $1.6 million next season, on the final year of his deal with the team, according to a report from the News and Observer. So even though it appears Peters would strongly prefer to leave CAR and Dundon would strongly prefer him to leave, the circumstances of a potential departure have financial implications for both, so it all could get a little sticky. Unless Peters gets hired quickly elsewhere. The Hurricanes have missed the playoffs four seasons in a row, coming off a 36-35-11 finish in 2017-18. During his time in Carolina, Peters had a combined record of 137-138-53. Peters will serve as Team Canada’s head coach for the IIHF World Championship next month in Denmark with Mike Yeo of the St. Louis Blues as associate coach and Bob Boughner of the Florida Panthers taking the reigns as an assistant. Dundon became majority owner of the Hurricanes franchise in January. The Texas businessman has since taken a hands-on approach to the franchise, which began with moving Ron Francis out of the general manager role and into his new role of president of hockey operations. Earlier Thursday, the team announced they hired Paul Krepelka as vice-president of hockey operations.